"Friendship" (clip) from DU BARRY WAS A LADY (1943) sung with Red Skelton (a .MP3 file courtesy Rhino Records). "Breezin' Along With the Breeze" (clip) with Desi Arnaz from THE LONG, LONG TRAILER (1954) (an .AU file courtesy Rhino Records). TVNow's monthly Lucille Ball schedule -when her films will be on TV. Love, Lucy by Lucille Ball with Betty Hannah Hoffman; foreword by Lucie Arnaz (New York : G.P. Putnam's Sons, c1996). Lucille: the life of Lucille Ball by Kathleen Brady (New York: Hyperion, c1994). 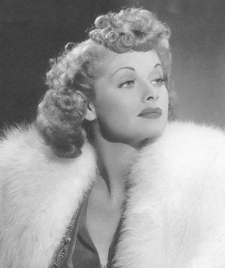 Forever Lucy: the life of Lucille Ball by Joe Morella and Edward Z. Epstein (Secaucus, N.J.: L. Stuart, c1986). Desilu: the story of Lucille Ball and Desi Arnaz by Coyne Steven Sanders and Tom Gilbert (New York: Morrow, c1993). Lovers: great romances of our time through the eyes of legendary writers by John Miller and Aaron Kenedi (Boston: Little, Brown & Co., 1999).